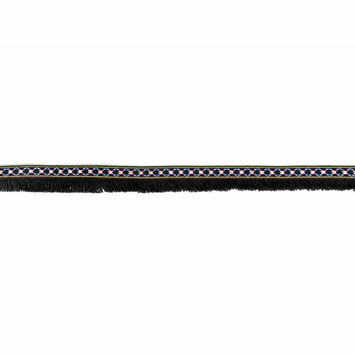 The detailed lines of an Ikat Fringe Trim are truly mesmerizing, making it the perfect accent for any project. The term ikat comes from a dying technique that has roots in Indonesia. It is formed by wrapping bundles of yarn into a desired pattern. Then, the yarns are dyed, and sometimes redyed, to create a gorgeous pattern that is the perfect accent to any piece. Attach ikat fringe trim to a pencil skirt for a bit of flare and fun, or to throw pillows for a funky home decor piece.